While blog-hopping this morning I saw the cutest baby today and needed to make it. 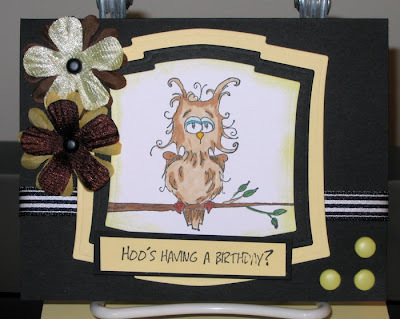 You can see the tutorial on Lauren Meader's blog, My Time, My Creations, My Stampendence. And lucky for me, a friend just recently gave birth to a son last Monday so seeing this card today was rather fortuitous! Lauren, if you should ever see this, it took me a little longer than 10 minutes, but I persevered and here it is. It's my first Onesie card, but it won't be my last. I used Baja Breeze and trimmed it up with Pacific Point. 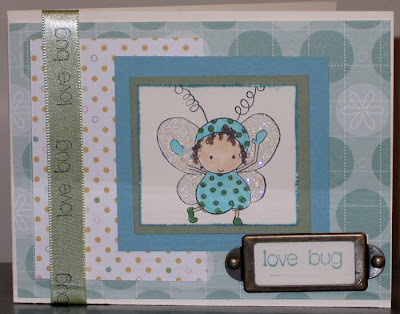 The stamp is "Love Bug" by Stamping Bella. I have had a tremendous amount of use from this stamp. I think it might be time to buy another Huggabugga stamp. It's a good thing I'll be attending a class at the Bella Boutique soon where I can pick up one or two. Well, that was short and sweet. I'm off to watch a movie with DH now. See y'all later. Birthdays, Birthdays & More Birthdays! February is a very active month for family birthdays, let me tell you. There are no less than seven, count 'em, 7 birthdays coming up. There is Kirsten (DD) on the 4th, Sheena (DIL) on the 7th, John (DH) on the 12th, Anne (SIS-I-L) on the 13th, Tiffany (DD) and Shirley (Sister) on the 17th and John (SIL) on the 22nd. That's a lot of birthday cakes even for me! Two of them are living in Britain, so that leaves just five cakes to be gobbled up. I think I am up to the task! Here are two cards that have been completed, but just to be safe, I'm not saying who will receive them. Both cards also fit with the SCS CC203. Both cards use Garden Green, Pacific Point and Baja Breeze. 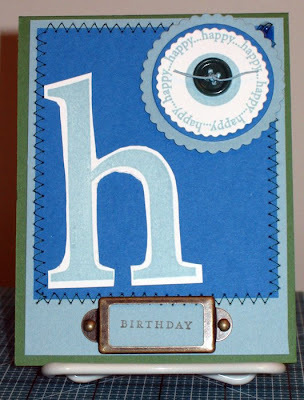 The "h" card uses stamps from CTMH. I used my Nestabilites for the scalloped and plain circles and added a green button to the centre. I only had white scrapper's floss, so I took a sponge and a Baja Breeze ink pad to turn it into blue scrapper's floss. Brilliant, I thought, for me anyway. Then I stamped the "Birthday" from SU's Happy Everything set with True Thyme ink because I didn't have any Garden Green ink. It will just have to do. I stitched using green thread, as well. 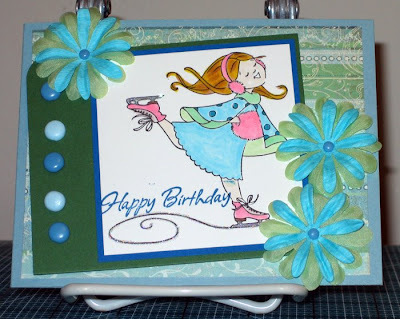 The second card uses "Gliding By" from Paper Pretties. I think this girl is adorable. The DP is from Two Scoops by BG. She is coloured with Copics and adorned with brads, also Two Scoops, some Prima flowers and a little Glamour Dust on the skate blades and the trail her skate leaves. Okay, it's back to the drawing board for four more cards. The post below is also a card I made for someone's birthday, again, not saying who! I always check the Color Throwdown blog to see if I've got the colours for their weekly challenge. Lucky for me, this week I did and this is my card for Color Throwdown #26. I haven't used this stamp in quite awhile and it seemed to be on my mind and was crying out to me. The card base is Pink Passion. I stamped the image on Pure Luxury white from Gina K. Designs and used my Copics for colouring. I can't sing the praises of this cardstock enough. I love the way the colour glides onto the paper and the vibrancy of the finished product. Anyway, on with the description. I mounted the white onto some Basic Black and used the Spiral punch on the left side of the black bit. For the Kraft requirement, I used the punch and stamp from the Cute & Curly set for the sentiment. That's it for now, short and sweet. Thanks for stopping by. I've been tagged Today I was tagged by the talented Tammy to take part in a fun little blog tag. Here is the instructions: 1. Go to your Picture Folder on your computer or wherever you store your pictures. 2. Go to the 6th Folder, then pick the 6th picture in that folder. 3. 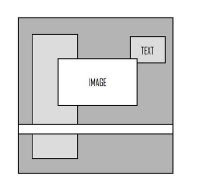 Post that picture on your blog and the story that goes along with the picture. 4. Tag 6 other people that you know or don’t know to do the same thing and leave a comment on their blog or an e-mail letting them know you chose them. Well, I followed the instructions explicitly and guess what? The picture that comes up is actually an 18 second video I took about one week before we moved from Thunder Bay. You want to know why that's amazing. I'll tell you why! It's because Tammy, the gal who tagged me, is from Thunder Bay and still visits my blog on a regular basis. Of all the pictures I've taken of grandkids since we've been here in Guelph, and I'm tagged by someone I met in Thunder Bay and the picture is one taken in Thunder Bay. I just think it's like serendipity or some other weird and wonderful thing happening. Okay, enough.....on to the video. There really isn't any story to go with this video. When I took it, I knew it would be one of the last times we would have deer in our front yard and DH loves that we lived in a spot where wildlife would wander in and out of our yard throughout the day. Even I miss it occasionally now that we're in a condo, but life moves on and you play the hand you're dealt. Now it's time to tag six unsuspecting people. Here we go. All right ladies, the ball's in your court. Show us your pictures. ....Whimsy Stamps. This design call for February 2009 was posted last Saturday and you have until January 26th to take a shot for this marvellous stamp company. I love Denise's designs. They are great to colour, they're cute and, well, they're whimsical. Go check out the link above, it goes directly to the post with the rules for entering. You won't be sorry. Here's my card. This duck looks 'lovesick' to me, at least for the purpose of this card. Being whimsical, it can look like whatever I want next time I ink it up. Today, he's lovesick. The sentiment is computer generated and says (in case you can't see it), "quackers" for you!. The hardware is Hodge Podge by SU. My card is 5-1/2" square and the base is Wild Wasabi. The DP is Stella Ruby by Basic Grey and I love it. Can you believe I found this bit in my scrap stash! I mounted it onto some corrugated paper scraps I also found in that drawer. The image was stamped onto my newest acquisition, Pure Luxury 120 lb. cardstock from Gina K. Designs. It's fabulous and the colour goes on like I'm spreading butter with a hot knife. It just melts onto the paper. Again, I placed some of the corrugated paper under the image as a mount. Next, I added some fibre by EK Success. I think the fibres add dimension and are a fun look for this card. Well, here's my entry and, to anyone who reads this, please wish me luck. 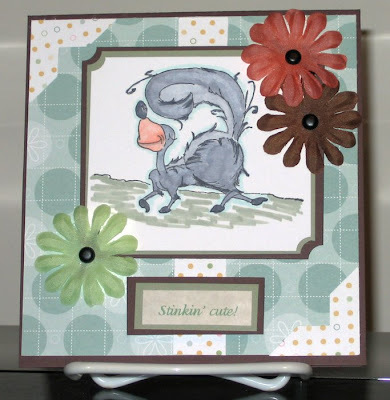 I would love to be a part of the Whimsy Stamps design group. I decided to try a challenge at The Lily Pad to make a digital scrapbook page. What do you think? I know, there's lots of room for improvement, but I do enjoy putzin' around with Photoshop CS3. It's not what I'd call user-friendly, but it is a lot of fun if you've got no other demands on your time. So, if you want to learn digi-scrapping, try The Lily Pad, they've got some fabulous papers, embellies, brushes and all manner of goodies to get you started. Two Peas ~ KWernerDesignBlog ~ and me! Now that's a combination I couldn't resist. As an avid follower of KWernerDesignBlog, I was totally swept up in the classes Kristina will be presenting over the next 12 months at Two Peas in a Bucket. I decided to play along. Clicking on the links above will display the cards designed by Kristina. Here are the cards I made, using the layout, but changing up the embellies because that's what I had on hand. I like they way they look and am now looking forward to next month's class. Outside of the the layouts on these cards, the differences are subtle. The overall difference on my cards is the patterned paper. "Love Blossoms Hearts with Glitter", by Heidi Grace. It was purchased in 2006 at MOA and I finally was able to use it. I loved it then and I love it now. 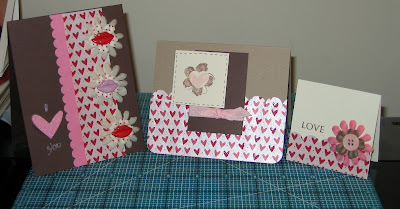 The card on the left has lips on the flowers instead of buttons and a heart where the word 'love' is stamped. I had to use the Slit punch by SU because I don't own the scallop edge punch, yet! The middle card is the one that taught me to measure twice, cut once. You will notice that the Chocolate Chip rectangle has been mis-measured. It was already attached to the card when I realized the Very Vanilla square would be even to the top of the Chocolate Chip rectangle, thereby not be as visually appealing as Kristina's sample. So, lesson learned: MEASURE TWICE, CUT ONCE. 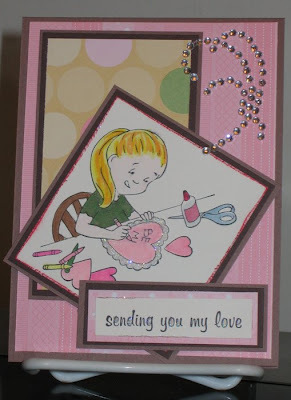 A very valuable lesson for life, never mind cardmaking! And lastly, the little 3" x 3" square. It's just adorable, isn't it? I so rarely think to use buttons as the centre of the flower, but I really, really like the way it looks. I'm hoping to use them more often, especially as I have about a thousand buttons and always forget them! So, I think should take a peek at both Two Peas and KWernerdesigns and join in the fun. Okay, off you go now to play with your stamps and stuff. See you again soon. Oh my heavens, two posts in one day. I was really thrilled to see the colour choices for today Color Throwdown # 25. Thrilled because, not only are they gorgeous, but I had all three colours! When all the stars align, what can a girl do but PLAY!!! Upon waking this morning, I had an idea for a stamped image, I just didn't know how I was going to work it onto a card. The stamp was sent to me by Cindi, one of my fellow Shackies. I was randomly chosen as the winner for a goodie package when I visited her blog for the World Open House back in December. The package contained this stamp and another cute little frog with a crown and other stuff, but I had an idea for the Tree stamp. I stamped the tree in black and then masked it. I stamped it twice more using Grey Flannel ink by CTMH. While I was blurfing, I saw the Color Throwdown # 25 challenge and things started to gel in my head. I knew I wanted to put ornaments on the tree so I rummaged through my stash and found these transparent buttons. I had blue ones, green ones, but no orange ones. There were however, clear ones, so I grabbed my trusty Copic marker in Orange and started colouring the clear buttons and soon they were orange. Now I could put my card together for the CT #25. I searched for more embellies and found the pins that I stuck into the ribbon, added three Antique brads and took a picture of my creation. Hope you all like it. ...again! 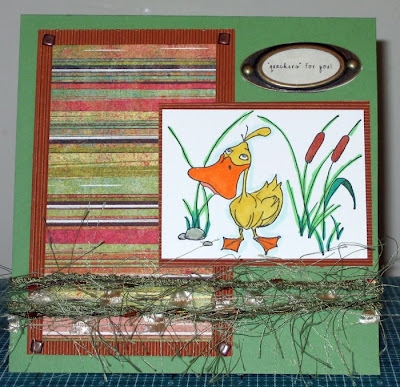 This time it's a challenge from Denise at Stamping with Denise, owner of Whimsy Stamps. The challenge is taking place on PCP and you can see all the rules here. The card base is black, which is the main focus of the challenge, and I paired it up with Lemon Tart by PTI. I used my Copic markers to colour this cute little owl in shades of brown from the "E" family of colours. Did you notice I applied a little "BG" colour to create eye-shadow? I added some Prima flowers in brown & yellow, a few yellow brads and some lovely black & white ribbon from my stash. The sentiment is from the Carolyn King collection by Gina K. Designs. Of course, the Labels 2 from Nestabilities were used also and I picked those up at Stamping Bella on my last visit to their delightful boutique. Okay, I think I covered everybody who has product on this card. Now to go put it into the forum at PCP. Wish me luck, I love the Whimsy Stamps. I decided to do a challenge! Isn't he adorable? While going over my Google Reader and keeping up with the blogs I enjoy, I discovered that Whimsy Stamps is sponsoring the Papertake Weekly Challenge this week. Since I have three new stamps from Whimsy Stamps, I decided to participate. I don't think it's necessary to use Whimsy Stamps, so don't let that stop you from joining in the fun! The card is 5-1/2" x 5-1/2". The base is Chocolate Chip to which I added some Stampin' Up double-sided DP. 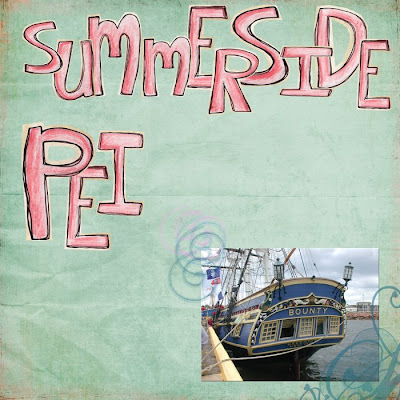 The image is stamped on Select White and double-matted onto Sage Shadow and Chocolate Chip. Of course I used my Copic markers for colouring. The sentiment is computer-generated and I used the RGB code for Sage Shadow. I added some Primas and brads and it was complete. 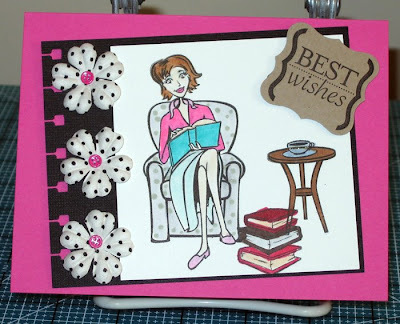 Go on over the Papertake Weekly Challenge and see what you can do! and needs DH to fix it, I found myself with some spare time to fill. Well, as you can see, the computer is up and running again and I have a scrapbook page and a card to share. 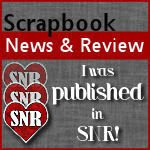 First, the 8" x 8" scrapbook page. Ava is about 18 hours old here and I'm just getting around to scrapping it now. My Bad! Anyway, I rummaged around in the paper bin and came up with this delicious paper by Stampin' Up. It's a double-sided paper and it's perfect for little girls. The stamp is Love Bug by Stamping Bella and the sparkly letters are by Dooblebug Design Inc. Ribbon is by American Crafts "Baby" collection. I took some of the DP scraps to make this card. The stamp is by Paper Pretties and is just right for Valentine's cards. I coloured it with Copic Markers and added some glitter dots and Glamour Dust around the hears. The cardstock colours are Close to Cocoa, Chocolate Chip and Very Vanilla. Now that I'm back in the groove, I'll be posting more often. Thanks for stopping by. I really had to work at getting myself into the groove again, but with a little help from certain blogs I have seen recently, I did it. First, Beth of Freckled And Fun gave me the boost I needed. She published a post on how to put your signature on your blog posts, something I wanted to do and didn't know how, so thank you Beth. Click on the link to read the post. Next I needed to pick a sketch because my own brain wasn't in gear yet, so off I went to SheetLoad of Cards. Thank you Alicia. Oh no, what colours to use??? This difficulty can also be solved by visiting Color Throwdown, which I did. I wasn't disappointed, I loved the colours for the first post of the new year. 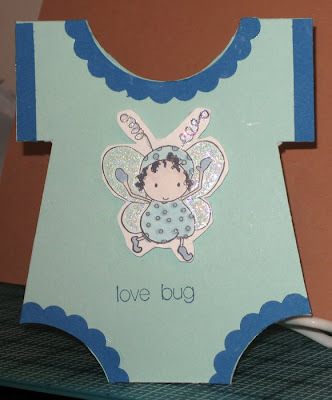 The only thing I had to do myself was pick my stamp and I chose Love Bug by Stamping Bella. So, thanks to everyone involved in getting me back on track. Here is my card. Isn't she adorable. 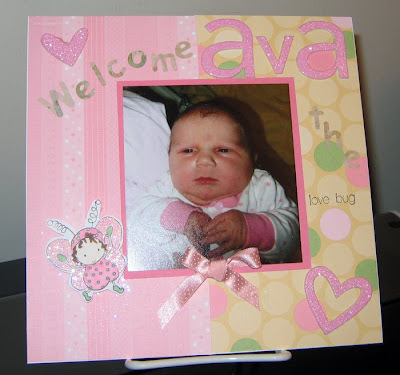 This stamp is going to be used over and over again as I scrapbook pages of Ava, my darling granddaughter! Ohhhh...I did have one orginal thought.....I stamped the ribbon with the sentiment too. First time I've tried that little trick.